What’s it all look like in the end? Editing XML is something system administrators seem to really hate; understandably, XML can employ a soup of standards! (Click to see Ken Sall‘s awesome image-map of XML related standards.) However, XML is awesome in providing a structured format for configuration and data files. In the OpenSolaris Automated Installer, XML is used as the manifest to select the system for install and how to install the system once selected. The Automated Installer uses a schema to verify the XML is acceptable to the installer engine and to provide a vocabulary of acceptable tags. However, if using a traditional text editor the process to author a manifest is rather painful since this data is not easily available to the author. 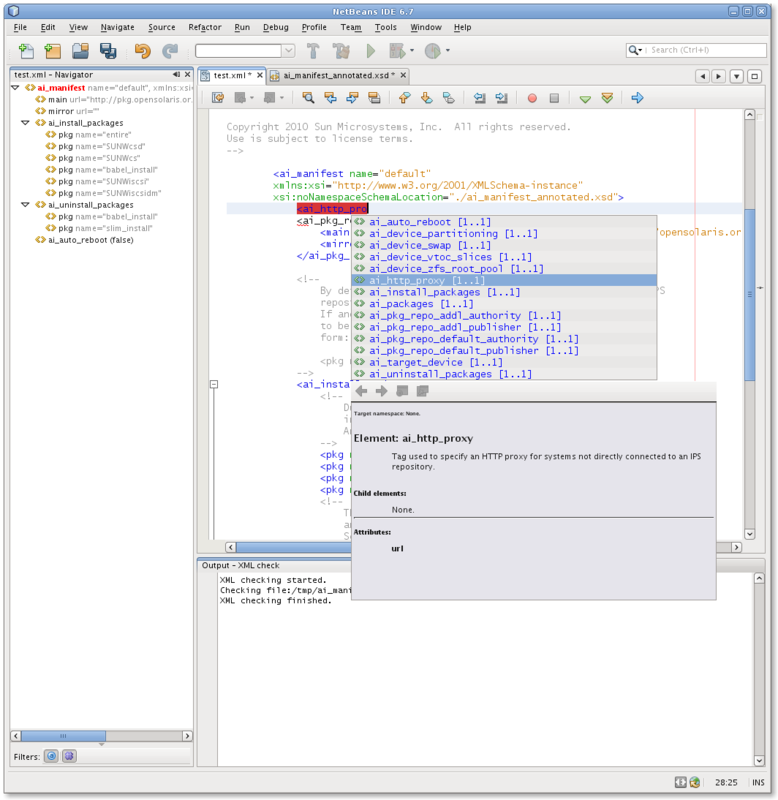 NetBeans, being a modern, integrated, developer environment provides a comprehensive XML authoring environment. One can provide a reference to an XML schema and then get: auto-completion of XML tags, the ability to validate the XML file under development against the schema and, if documented, tool-tips for each tag. However, the one issue for someone authoring Automated Installer manifests is NetBeans only supports XML Schema type schemas and the Automated Installer uses a RelaxNG schema. The answer is to convert the schema to XML Schema and for that, enter the Trang multi-format schema converter which can convert RelaxNG (.rng) to XML Schema (.xsd). Or download my annotated version below. To use NetBeans’ context sensitive code completion, one needs an AI schema in XSD format. An annotated schema can be downloaded: AI Schema, Criteria Schema. Now, if you begin typing a tag (start a tag with <) between the <ai_manifest> tags, you should get a pop-up window with context acceptable tags and documentation on each one. Further, you can go to the Run menu and use the Validate XML option to use NetBeans for help on any typos in the file. You can do the same for criteria manifests using the provided schema for them as well. However, you will not be able to use the <ai_embedded_manifest> or <sc_embedded_manifest> tags, instead use the <ai_manifest> and <sc_manifest> tags to specify a file URI and keep your manifests in separate files for ease of manipulation. Notice the context sensitive editor here. It shows that the <ai_http_proxy> tag has a url attribute and provides documentation on the <ai_http_proxy> tag. Lastly, check out the XML navigator provided on the right side showing the hierarchal breakdown of the document. They will all be linked in your criteria manifest using the <ai_manifest> and <sc_manifest> tags. Then to publish your manifest, simply run installadm add -m path to your criteria manifest -n your AI service name! To use Trang, one simply provides a schema’s current type and the desired output type, and an input and output filename. For the AI Manifest Schema, one simply downloads Trang and runs, java -jar trang.jar -I RNG -O XSD /usr/share/auto_install/ai_manifest.rng ai_manifest.xsd. This entry was written by Clay, posted on March 6, 2010 at 2:43 pm, filed under Solaris Install. Bookmark the permalink. Follow any comments here with the RSS feed for this post. Post a comment or leave a trackback: Trackback URL.